What Is 24-7 Wealth Club? 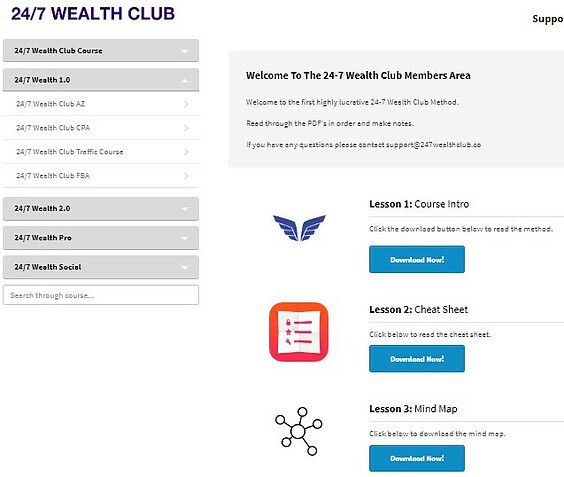 What Does 24-7 Wealth Club Offer? 24-7 Wealth Club is an online money-making program created by a man named Richard. You can access it at 247wealthclub.com, and it sells for $37. 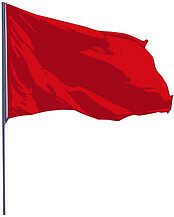 Right away red flags are popping up because this type of marketing is what I call scammy. 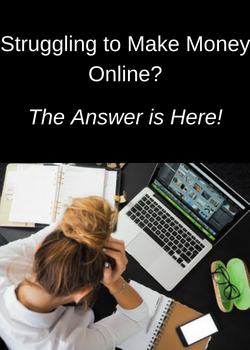 I have enough experience to know that no system is going to enable you to start making that kind of income starting out–it just doesn’t work that way! Making money online takes hard work, time, and commitment. Successful online entrepreneurs take months and years to make consistent income. So it’s obvious from the start that 24-7 Wealth Club is aimed at those who are naive, inexperienced, or desperate to earn a living online. They won’t know how ridiculous these income claims are and will believe that it’s possible to get rich quick with this system. Richard tells you that he has 191 members and will offer lifetime access to this “life-changing, unstoppably powerful opportunity” to 9 more people for the price of $37 and throw in $2,500 in bonuses! However, the one thing that he never tells you in the whole video is anything about what 24-7 Wealth Club actually is! So the beginners and newbies that they’re targeting are supposed to be so happy at the idea that they can get rich, they’ll buy it without knowing anything about it. This is another big red flag for me and is a common marketing strategy for scam-type programs. If a platform is legitimate, they’re happy to show you what’s in it and what features they offer. So I purchased the program for $37 to check out what it is and what they offer, and I’ll detail that for you next! When I got access to the members area, I wasn’t surprised by what I saw–a rehashed version of another program I reviewed in September called Wealth Academy. I gave that system a rating of 2 out of 5 and did not recommend buying it. To make matters worse, I saw this program twice again in November with Smart Cash App and Wealth Project, and a third time in January with Fast Cash App! I gave a thumbs down to all of these programs and advised my readers not to buy them. The 1.0 version of all of these programs are basic guides to selling on Amazon, Fulfillment By Amazon, driving traffic, and monetizing a site with CPA, Cost Per Action, ads. Not only are they way too general to be of any use making money, some of the information is outdated and not valid anymore! However, just having marketing materials like videos and email swipes doesn’t mean that anyone will be able to successfully promote these products and make money. You have to have a website that gets targeted traffic to make money! None of the traffic methods that they show you in the program are going to drive traffic to your site fast to start making money right away. Also, some of the methods are not effective to get ranked well in the search engines, and some are considered spam. Any paid methods will be very costly to anyone who’s not experienced. It doesn’t make any difference how many email swipes you have or how great they are at converting. If you don’t have an email list, your only choice is to spend money to market to other people’s list. No beginner is going to know how to successfully do this without wasting a lot of money. Plus, anyone who has a sizable email list sure doesn’t need the general guides from 24-7 Wealth Club to know how to make money from it! I didn’t find anything in this system that was worth paying the $37. Any information was too general, not actionable for beginners, and is readily available online for free with just a few Google searches. Next, I’ll detail for you the upsells that followed the main sales video! There were 3 upsells offered before I got access to the members area. Once I saw the 1st upsell video, I knew that 24-7 Wealth Club was a rehashed version of another program. All the upsells are the ones offered from Wealth Academy–they didn’t even change the name or the videos! ~ Wealth Academy 2.0, selling for $197–With this upgrade you’re supposed to be able to make 6 times more money 3 times faster, up to $6,500 a day! Do you get to know what the upgrade is before you buy it? No, again you’re supposed to just be impressed that it can make a lot more money. ~ Wealth Academy Pro, selling for $177–If $6,500 isn’t enough for you, just buy this upgrade and you can make $10,000 a day! You don’t know how, just more hype to get more money out of you. ~ Wealthy Academy Social, selling for $97–This upgrade is supposed to show you how to use social media to explode your earnings 10x, 100x, even 1000x! In fact, they take it over the moon with the income claims with this one: I didn’t see multi-millionaires sprouting up all over from all the other programs these upsells were offered from, so I passed on them! ~ Totally Ridiculous Income Claims–The creator of this program would have you believe that for a total of $508 you can start earning up to $36,500,000 a year! No one with any experience at all would believe claims like this. 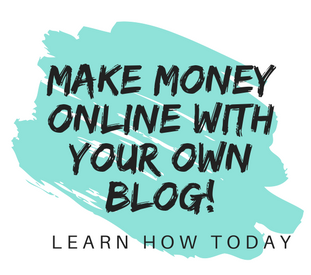 But for those who are new to making money online, you won’t make this kind of money–in fact, it’s my opinion that you’re more likely to lose money. 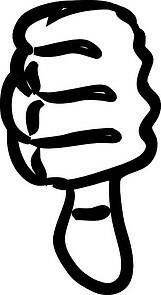 ~ Scammy Marketing–The marketing tactics used in the sales videos are ones that you find in many scam-type programs. They’re designed to get you to part with your hard-earned money based solely on being dazzled by big dollar signs. 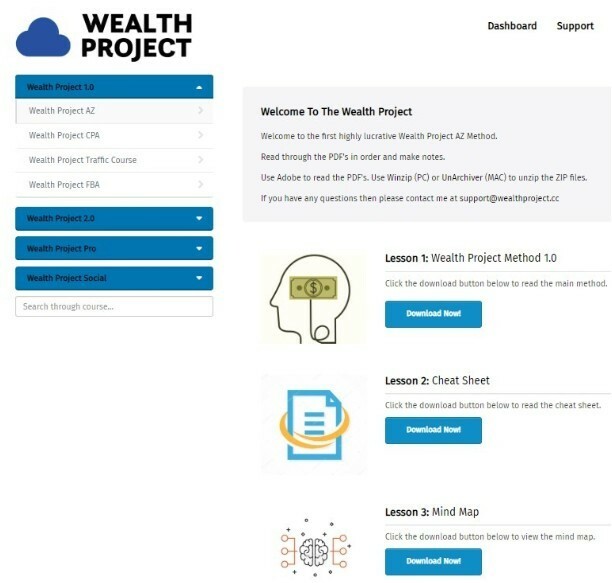 ~ Rehashed Version of Wealth Academy–24-7 Wealth Club is basically another version of a program that’s been circulating under various names for several months now. If a program is successful and profitable, you protect the brand to keep making sales and expand your business. The fact that this program keeps getting reworked and rebranded shows me that there isn’t true value there. ~ Very Poor Program Materials–Nothing that I saw in this program will even begin to enable anyone to start making money online right away. The materials are general, some are outdated, and some are just not effective at driving traffic to your site. No traffic=No Sales=No Income! ~ Expensive Upsells–The upsells offered total close to $500 and are marketed as “all new” and “once in a lifetime” opportunities. But these have been offered with several programs before, and there’s no way that they will produce the results claimed. Here at Build Your Early Retirement, we give 24-7 Wealth Club our lowest rating of 1 out of 5. Due to the concerns listed above, I do not recommend anyone buy this program. It’s my opinion that you’re likely to lose money more than you’ll make any money at all. If you are really serious about making money online, you need to know that it takes a lot of effort and time. But for those who are willing to stick with it and put in the work, there is consistent, long-term, substantial money to be made! I encourage you to check out my #1 rated program. It’s where I learned how to start my online business, and I now have 6 websites hosted with them. They have an awesome online community that supports you and answers any questions you have. They’re completely legitimate and have a starter program where you get to see all of their features and get 10 lessons of training without even putting down a credit card! You can stay as a starter member and develop 2 free websites for free, or you can own up to 25 of your own websites and get all the training for just $49 per month. See how easy it is to create your first website in just minutes! Have you had any experience with 24-7 Wealth Club or any of the programs mentioned above? I’d love to hear about it along with any questions you have below! I’m very glad you found it helpful, and thanks for taking the time to stop by and read my review! Oh Janelle! 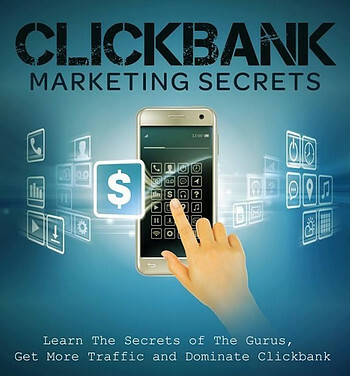 I hope you were able to get a refund from Clickbank for your $37. The sales video sounds quite laughable. I’ve seen a few that follow a very similar pattern to that, where there really isn’t much information about the product, just that it will make you LOADS OF CASH!! Fast!! The fact they tell you it’s a secret is funny too. It sounds like you’ve been in this long enough to sniff out a scam when you see one. Thanks for highlighting 24-7 Wealth Club and some other similar ones to avoid. From my own experience with making money online, I also prefer affiliate marketing. I agree with you 100% that it takes time, effort and dedication. It is well worth it in the end though. It is a legitimate way to make sustainable income online as you are building your very own business, not someone else’s. It is an excellent idea for anyone who wants to transition out of the workforce, or add another income stream. A lot of these sales videos can be pretty laughable, especially the hard luck stories! I always wind up mad, though, when I see how they try to lure in those who don’t have the experience to see through them. Glad to know you’re making a success of your affiliate marketing business, and I hope it continues! 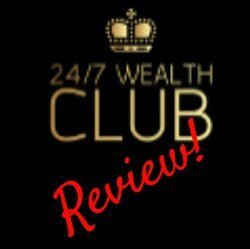 I’ve really enjoyed reading this article as you’ve provided us with lots of useful information on 24-7 Wealth Club Review. I must confess this is just a relpicate of some existing programs and softwares on affiliate marketing that I know. Despite the rise in online scams, there still are legit ways of making money online but this site doesn’t seems unique to my view and it is great that you are doing your research before parting with your hard earned money. Thanks a lot for taking your precious time in writing this detailed blog. Keep up the good work! Thank you so much, and I’ll definitely keep writing reviews to expose programs like this!